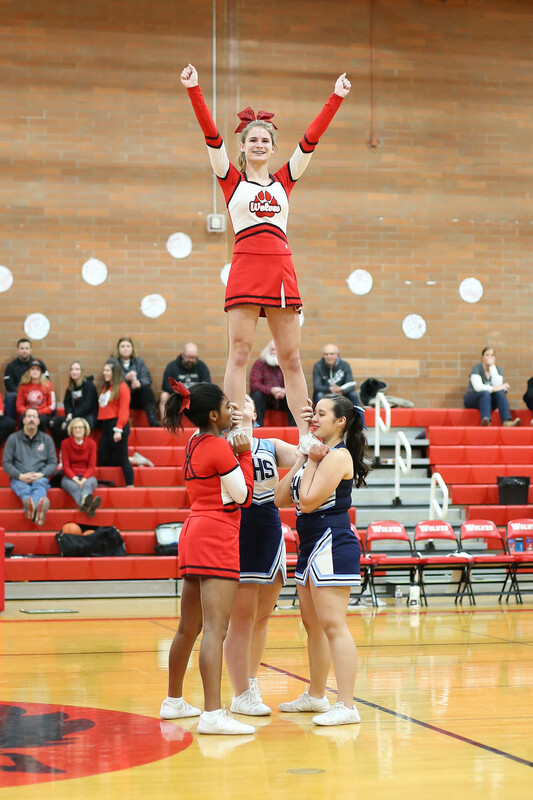 Wolves (l to r) Ashleigh Battaglia, Mica Shipley, and Emily Fiedler take to the skies. Fiedler stands tall in the spotlight. 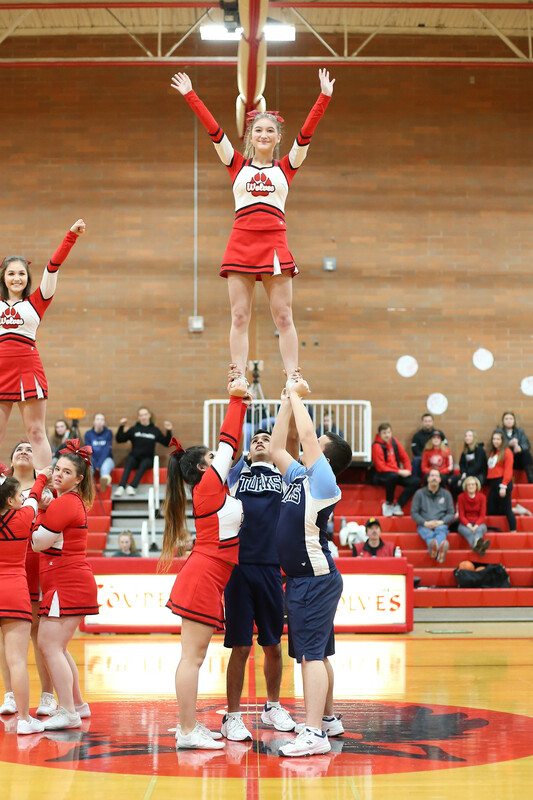 The Wolves work the sidelines, while volleyball player Lucy Sandahl (far left, in the stands) is shocked to hear about the snow forecast. 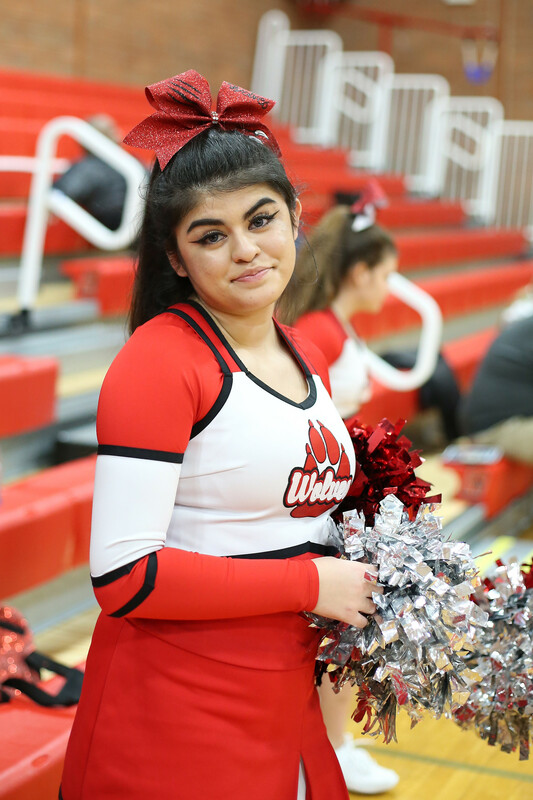 Shipley, who’s been doing competition cheer since she was a little girl, is an old pro at this kind of thing. Battaglia and Fiedler get an airborne workout. They got a well-deserved curtain call. 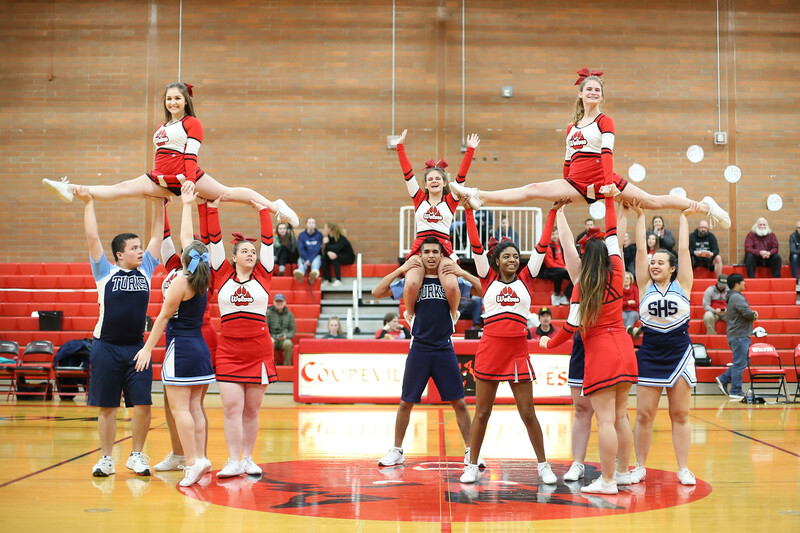 Days after claiming 3rd place at state, while competing for the first time since 2011, the Coupeville High School cheer squad returned to its own gym Wednesday night. 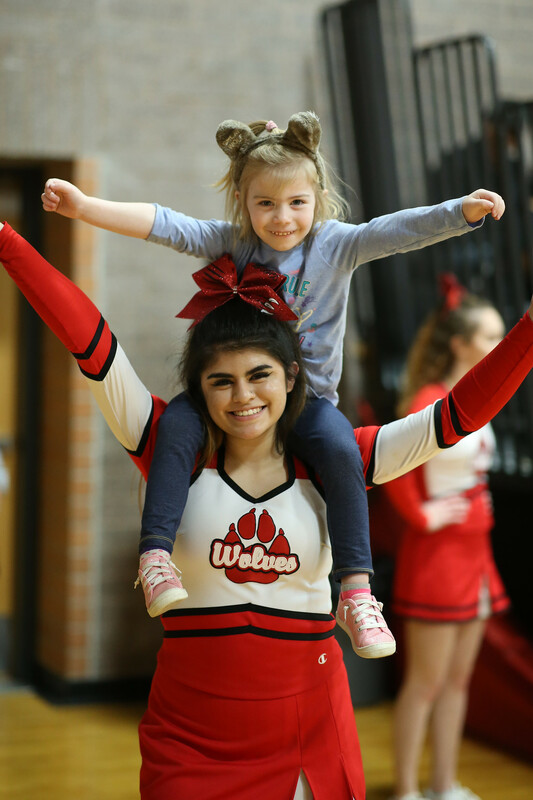 With snow and ice throwing the district basketball playoffs into disarray, CHS unexpectedly found itself hosting a home game, which gave the Wolf cheerleaders a chance to work the sidelines one more time. 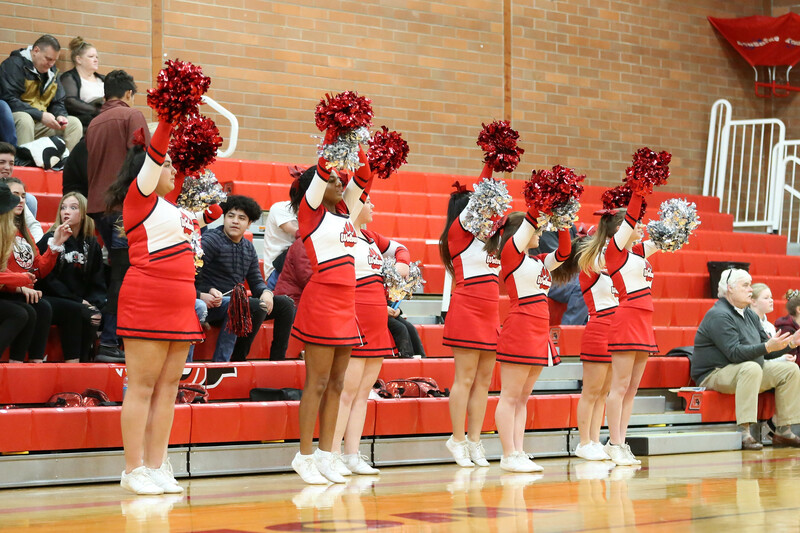 In a nice bit of coincidence, the visiting team was Sultan, which brought its own cheerleaders along. 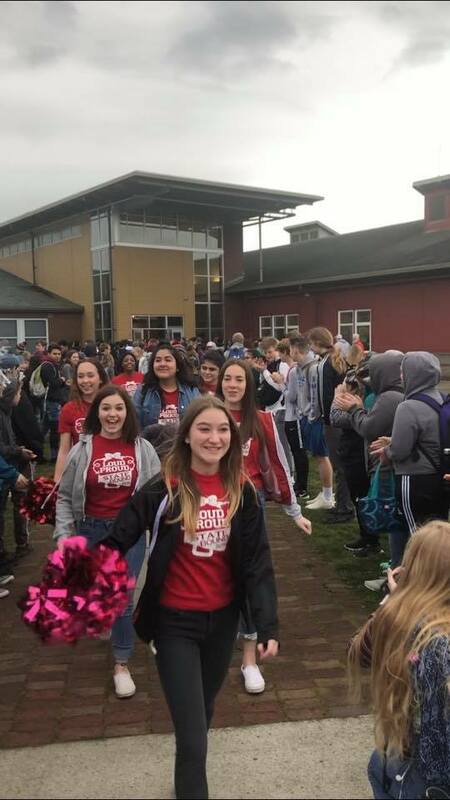 The Turk cheer squad claimed the 1A state title in Coupeville’s class, Game Day Small, and the coaches from the two North Sound Conference schools became new best friends during the big meet. 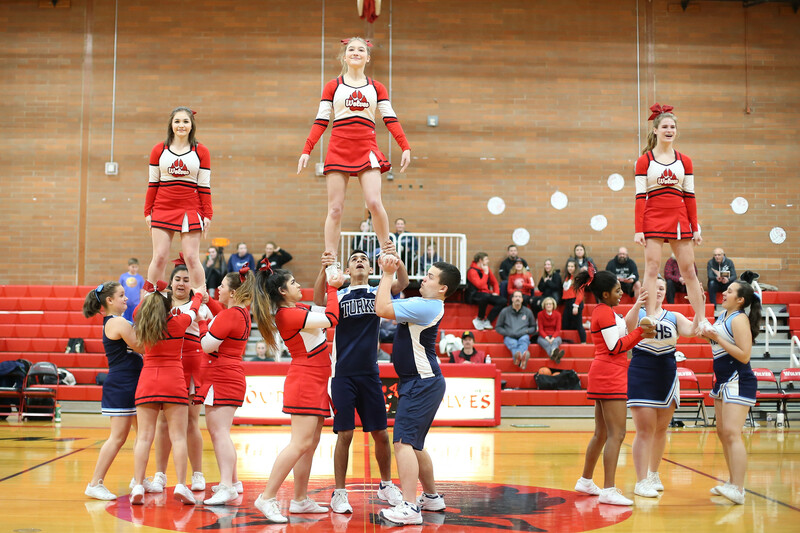 Keeping that friendship going, the two cheer squads joined together at halftime Wednesday to pull off a joint performance. 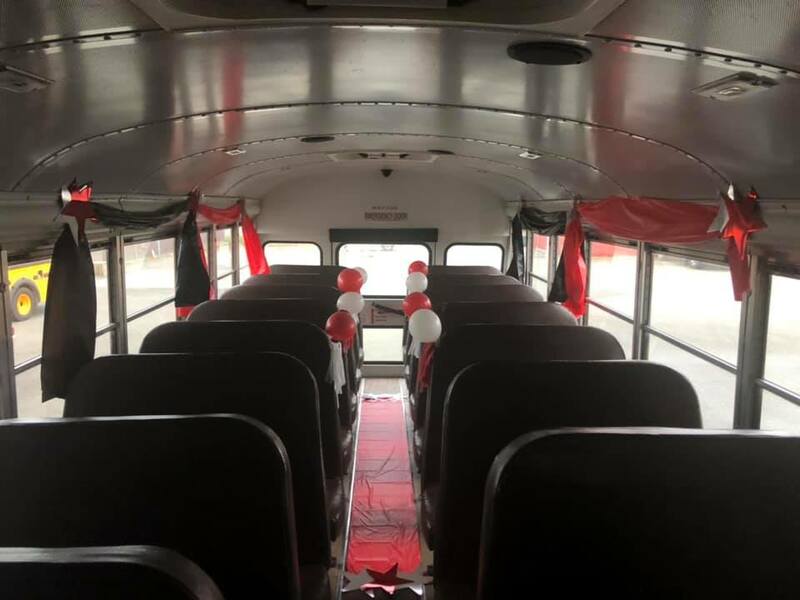 The bus is decked out for the trip. 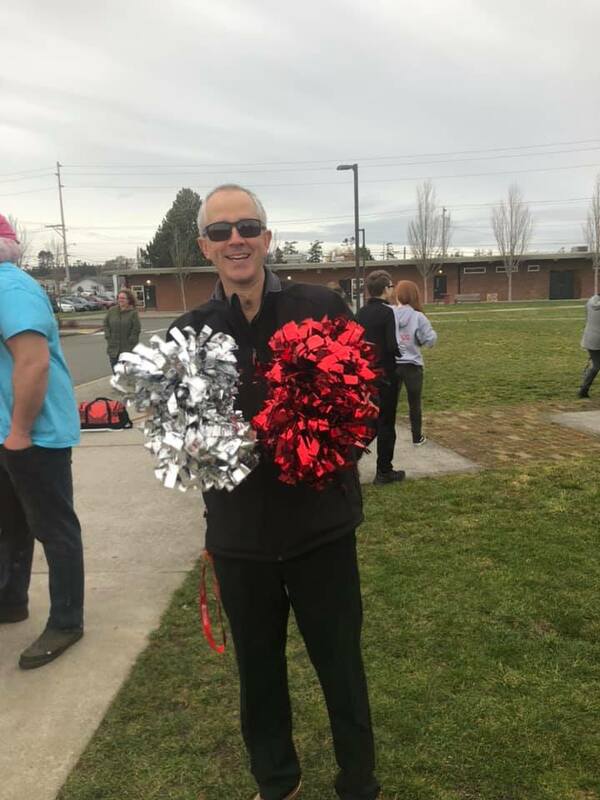 Coupeville Schools Superintendent Steve King earns honorary team membership. 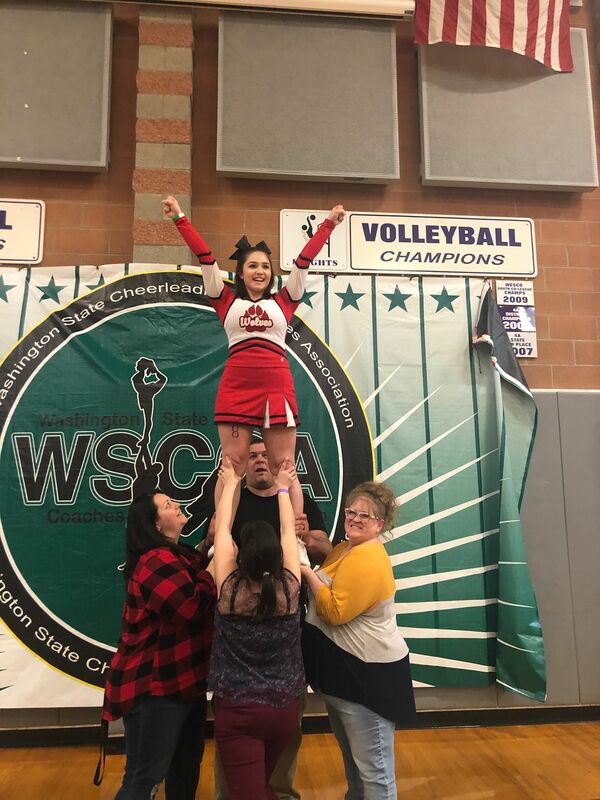 Back, l to r: Bella Velasco, Marenna Rebischke-Smith, Kim Castro, Ashleigh Battaglia, Mica Shipley, Julie Bucio, Coral Caveness, Melia Welling. Front: Emily Fiedler, Ja’Tarya Hoskins. Back on top, in the blink of an eye. 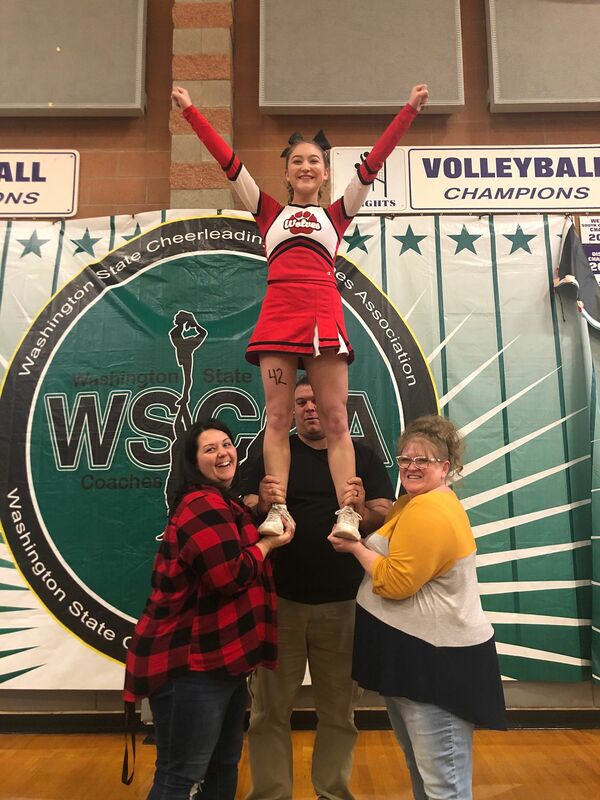 After not fielding a competition cheer squad since 2011, Coupeville High School got back into the game this winter under first-year coach BreAnna Boon. 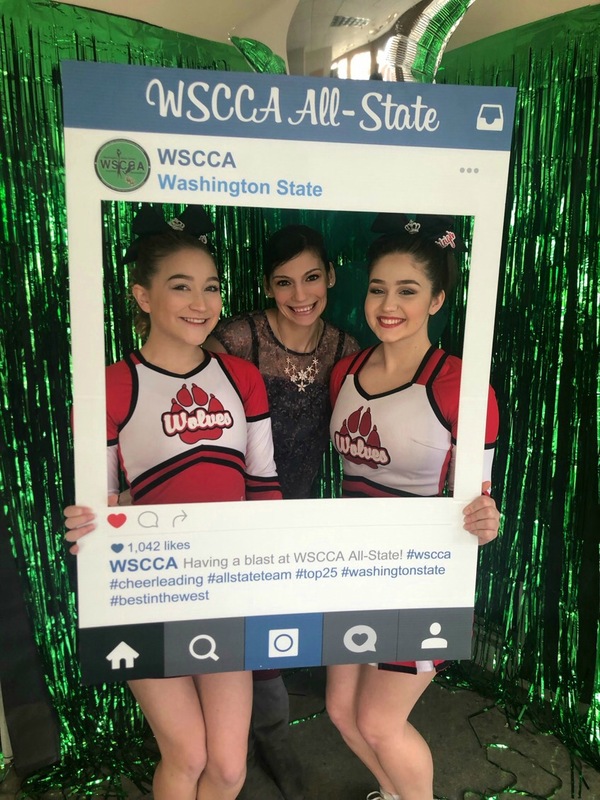 And, just like that (after a lot of hard work and several strong performances at meets), the Wolves are bound for the state championships. 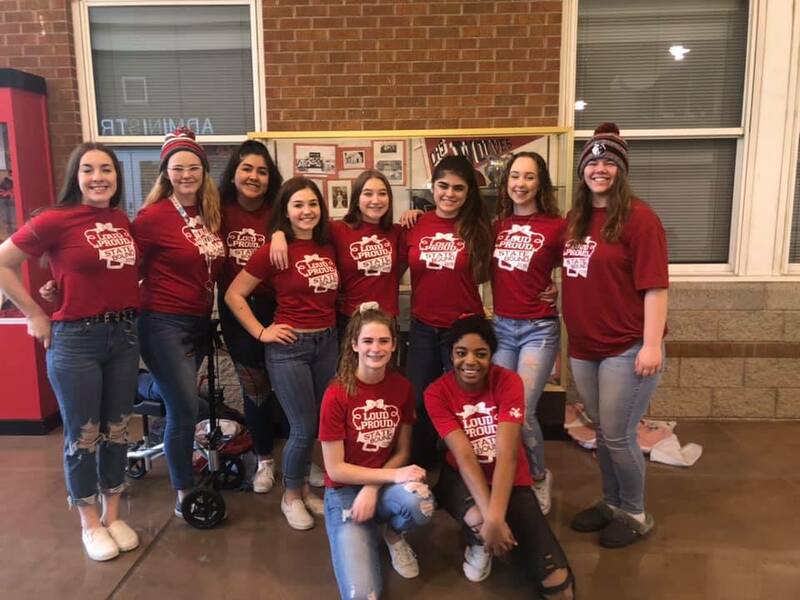 The 10-woman team hit the road Friday, heading for Battle Ground, where it will compete in Small Game Day Saturday afternoon. 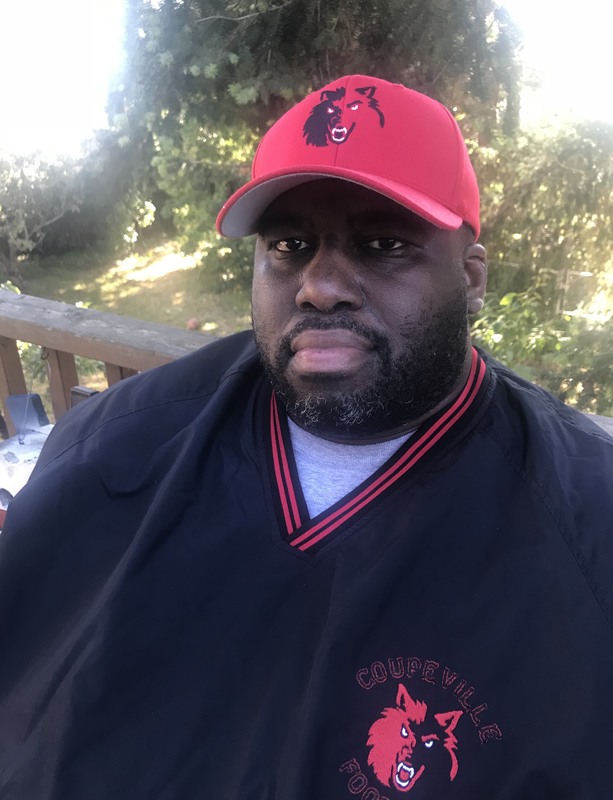 As one of just four 1A schools to make the cut in the event, CHS is guaranteed to add a new plaque to the school’s Wall of Fame. 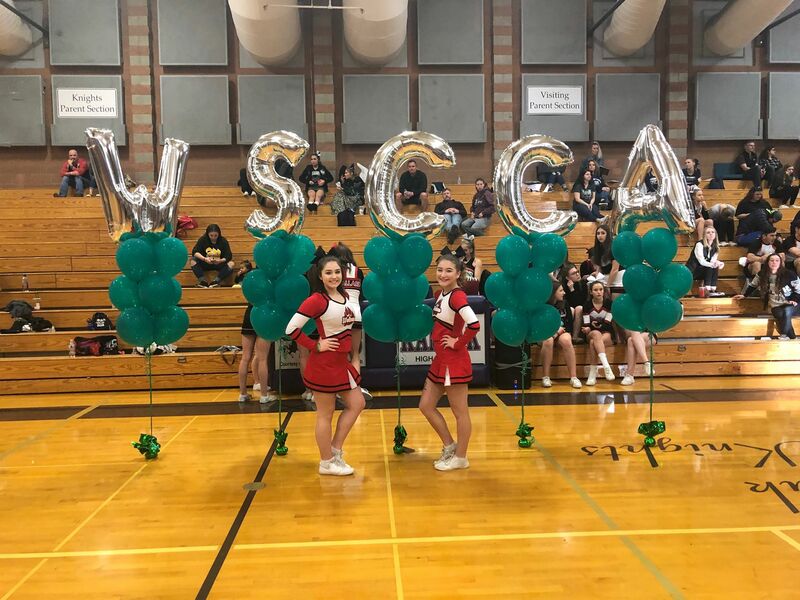 However they do on the big stage, these Wolves will join the 2006 (state champs), 2007 (2nd place) and 2011 (4th place) Coupeville cheer squads up on the wall in the gym. 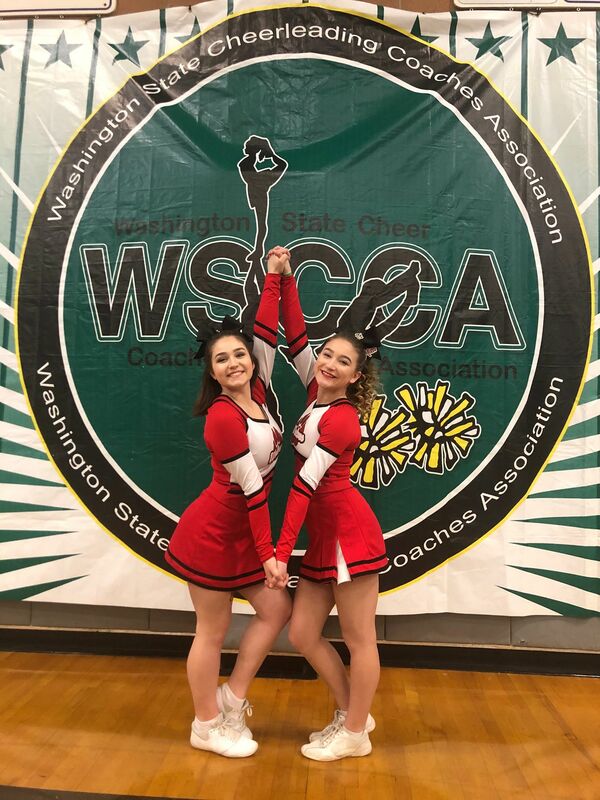 Loud, proud and state bound.